Last month, I felt a disturbance in the Force, as if millions of crappy songs from 2003 to 2015 cried out in terror and were suddenly silenced. And they were. MySpace — yes, it’s still around — lost all the music uploaded to the site between these years thanks to some corrupted data during a server migration. Whoops. And while the news probably doesn’t put a dent in most people’s days, since those musically inclined have long since moved on to other social networks and services (such as SoundCloud), all hope is not lost. 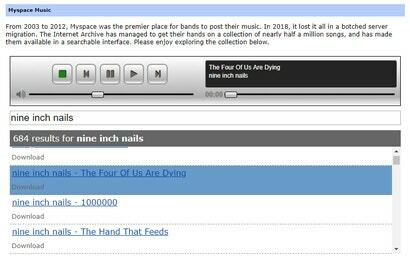 Thanks to an “anonymous academic study”, a total of 490,000 MP3s previously living on MySpace between 2008 and 2010 have been recovered. 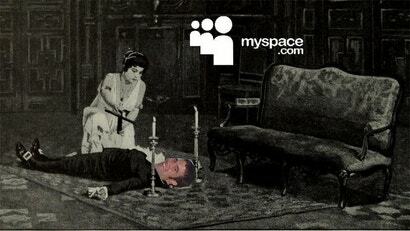 You can now find this archive, dubbed the “The Myspace Dragon Hoard”, over at archive.org. There are a few caveats to this mega-collection, however. First off, it’s huge — a whopping 1.3TB, split into 144 separate .ZIP archives. While a handy .TSV file (short for Table-Separate Values) can help you figure out what’s in the entire collection, there’s no easy way to grab a single archive that contains a smattering of songs you want. If you’re looking to dump said archive to your desktop or laptop, I recommend using a tool such as JDownloader to queue and download all the .ZIP files. Also, you probably don’t want to do this on Wi-Fi, nor at your local cafe (or other favourite hotspot). Stick to a wired connection, and here’s hoping your ISP doesn’t have any annoying data caps. Otherwise, you can search for individual songs and stream them directly from archive.org. Just use the “Hobbit” tool created for this archive, which gives you a MySpace-like player and search abilities directly in your browser. The tool might take a bit of time to load the index for the massive MP3 collection, but it works — crudely. You can’t use this player to browse, only search, so prepare to spend some time querying for your favourite, obscure bands.